Are you wondering which is the best lens for Nikon D3500? If you are looking to an answer for this question, you came to the right place. 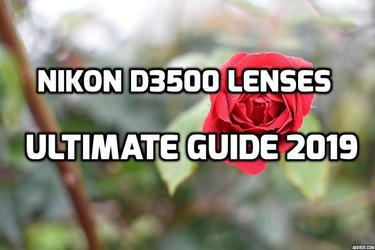 Keep reading our Ultimate Nikon D3500 lenses buying guide to discover what are best lenses on the market in 2019. You will also learn which lenses you should avoid as they are not worth the price. 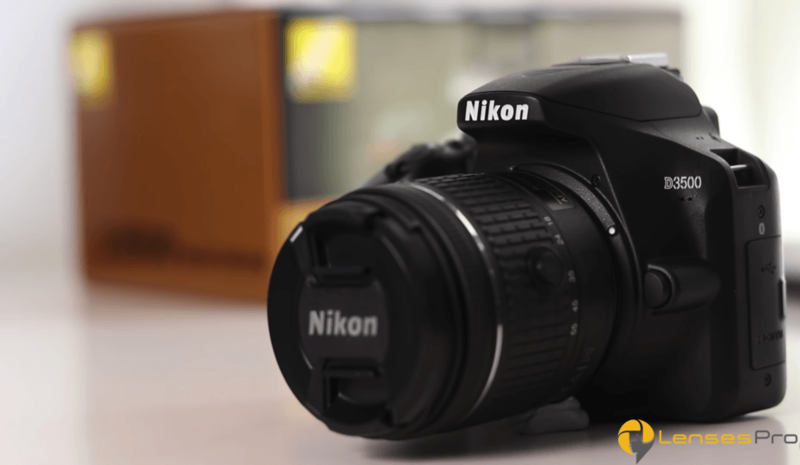 First of all, a few words about Nikon D3500 DSLR camera itself and why it holds tremendous value even for a brand new camera. Having been released in the September of last year Nikon D3500 is the newest edition from Nikon company. This is a DX-format DSLR with 24.2 megapixels with the ability of 5 FPS Continuous Shooting. Since this is a Nikon product, as expected it has many perks and features. One of them is 60fps video shooting at Full HD. It captures some amazing photos with crisp quality, however, if you plan on recording video as well, it will do a great job. ISO goes up to 25,600 guaranteeing good low-light performance. It’s portable, well built from high-quality materials while at the same time offering great value. If you don’t already own this masterpiece you can get it on Amazon for under 500$ at the moment, with two bonus kit lenses: 18-55mm f/3.5-5.6G and 70-300mm f/4.5-6.3G. There is also an awesome offer for a bundle at the moment, you should really check it out. 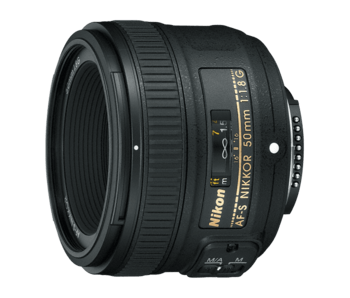 First on our list is Nikon 50mm F/1.8G, a prime lens for beginners with decent quality. Build quality is not top-notch and its mostly made out of plastic (expect focus ring which is from solid lightweight metal). Prime lenses are cheaper because they have fewer parts as there is no need for moving mechanism. It is expected that prime that cost under 200$ have some shortcomings and in this case, it’s only built quality. Since it’s made from plastic material, it feels cheap. Still, that is normal for the lens of this price since even for a company like Nikon. On the other side, the quality of the photos you take with this beauty is outstanding. Photos look great with crisp details which can prove useful when shooting portraits. Minimum focus distance of this lens is 1.48 ft (0.45 m) allowing you to shoot close-up photography with ease. This lens if for photographers who are looking for a portrait lens that will shot great photos but do not want to spend a fortune on a prime lens. Nikon 50mm F/1.8G works well on both DX and FX format DSLR-s because its optimized on both formats for edge to edge sharpness. Filter Thread is 58 mm and autofocus is silent and quick. Thanks to fast f/1.8 aperture low-light performance is also good. You can even capture photos in darker areas with brilliance. The thing that we were most surprised with, is definitely, backround blur. We tested this lens for a couple of hours and almost every pictured look gorgeous with a beautiful blur in the background. This a middle range lens from Tokina that is the perfect choice for landscapes and wide-angle photos in general. One thing we noticed while testing it is shorter focal range. We think it should be longer, which would give this lens more versatility. If you plan on photographing landscape most of the time then it angles of view will be just fine. 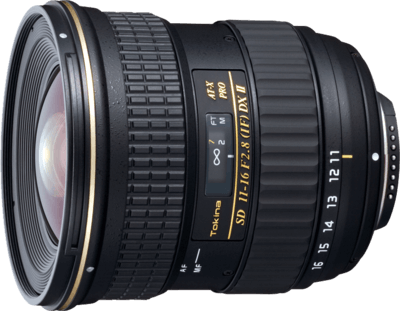 Usually, lenses for third-party companies such as Tokina offer better value when compared to Nikon or Canon which is a case with Tokina 11-16mm F/2.8. It is made from high-quality materials and the lens itself feels natural when holding. Bokeh is not that great when compared to other lenses of similar price but it does the job. We chose this lens as our choice because of other good features. There is no Chromatic Aberration and focusing is better then you would expect from a 400$ lens. Tokina 11-16mm f/2.8 will fit perfectly to anyone who needs a wide-angle lens that has the good build quality and accurate focusing. The Downside of this Tokina lens is weight. Its noticeable heavy for a wide-angle lens and even tho you may not feel it right away, it will become a problem if you are taking hand shoot photos for extended periods of time. Also, we noticed that the focus ring doesn’t always work perfectly and can put a camera out of focus sometimes. It’s clear that Tokina is cutting corners on the mechanics to get better optics, which we are fine with! Sharpness is excellent and we managed to get some stunning photos with this Tokina 11-16mm combined with Nikon D3500 DSLR. Yes, this lens does have some minor issues but the overall experience is good and we recommend this lens to anyone that want to photograph landscapes. There are a few good options to choose when looking for all-in-one lenses. Our top choice was Nikon 18-200mm for a few reasons. All-in-one lenses are perfect when you need one lens to deliver great performance in different kind of situations. Shooting landscapes, portraits, wildlife or street photography, you will have good performance if you decide on this lens. 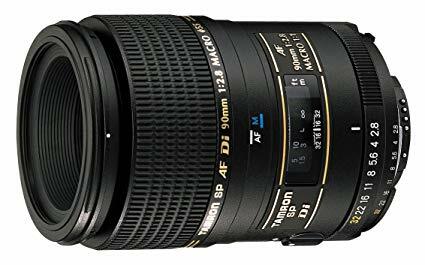 If you are however more into telephoto lenses, but still want an all-in-one, you could also go with a Nikon 18-300MM F/3.5-6.3G, it has more powerful zoom but a little bit more distortion at the high end. Bokeh is good enough to make your background blur look beautiful, especially when it comes to landscape and portrait photography. We do, however, recommend prime lens if you are planning on doing a lot of portraits. They are cheaper and will outperform other types of lenses when it comes to portrait photography. Back on 18-200mm, even tho build quality is good, it’s built from plastic materials which can feel a little cheap for 600$ lens. The area, where this lens lacks performance, is dark situations, but this can be either fixed by increasing ISO or in post-processing. Telephoto or zoom lenses are perfect for situations where you need to capture objects or animals in distance. 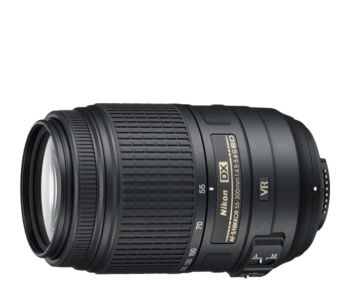 For this type of lenses, our top choice is Nikon 55-300mm F/4.5-5.6G. It is one of the best value options on this list. It is built mostly from plastic, so it does feel cheap. However, if you want telephoto made out of metal you will need to spend more then double the money, at least! Nikon uses plastic to save on both the weight and money, which they did a good job with this one. Images are crisp with a slight distortion at the 300mm end, which is correctable. Best telephoto lens to zoom in and capture perfect photos in 2019. Some users have complained about focus, yet we didn’t have any negative experience with it. It has always been smooth and silent for us. It did felt a little bit sticky when zooming all the way at first, but after some uses, it worked with no problems. If you bought this lens and zoom isn’t smooth enough, don’t worry. Just play a little bit with it, zoom a couple of times all the way in and out and it should work great then. 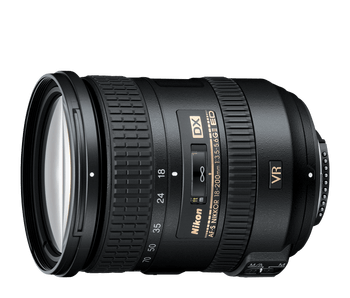 You probably know that Nikon includes VR on almost any lens today, which is especially important with a telephoto lens. We are not sure did Nikon done anything special with a VR for this example, but we felt it does a fantastic job. The steady shooting was even possible at the highest zoom even when shooting without a tripod. For the 400$ price tag, you are getting enormous value. We highly recommend it! For a Macro lens, we decided to go with a third party company, Tamron. The lens that will do the best job when it comes to macro photography is Tamron 90mm F/2.8. We did consider including Nikon 105mm f/2.8G, as it may be a more popular and well-established choice, but after considering twice the price for a little bit more features and performance, we didn’t think it was worth it. Autofocus is a little bit noisy especially when you are switching from manual to autofocus mode. This means the lens is not as refined as ones from Nikon. After few hours of playing with this lens combined with Nikon D3500 DSLR camera, our advice is to shoot at f11 in a little bit darker areas (shadows, shade etc). This will allow your lens to get the needed amount of light for better focus. Great option from Tamron for macro photography. As far as the quality of photos goes, this thing is excellent. We were able to shoot stunning close up photos of animals and plants. Colors are vibrant while offering crisp details. There is no Image Stabilization (Vibration Compensation) on this model which can be very crucial if you are shooting without a tripod.. There is a newer model of this macro lens which comes with VC and a few improvements. It does cost a little bit more but it just might be worth it in the long run. Click here to check it out. 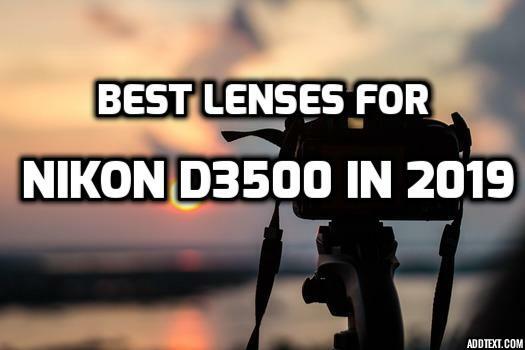 We really hope our guide “Best lenses for Nikon D3500 In 2019” helped you choose the best lens for yourself. As you already know different type of lenses are good for different things but it will also depend a lot from personal preference. One lens doesn’t have to be perfect for everyone and it usually isn’t. That’s why it is best to test a couple of lenses out before making your decision. If you live close to camera and lenses shop, you should go there and tell them what kind of photography you are into and what are you looking in a lens. If you are not able to test before buying, feel free to check a few more guides, read some reviews but also send us to email if you need some advice. We hope you find best the lens for Nikon D3500. Ultimate guide if you need best lenses for Nikon D3500 to boost photo quality of your D3500 camera.